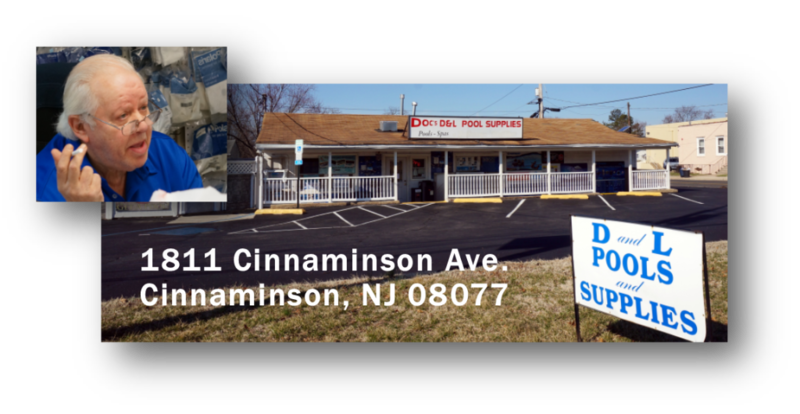 A South Jersey staple for fifty years, Doc’s D&L Pools has been a source of trusted pool advice for thousands of satisfied retail customers and a wholesale distributor of pool equipment, supplies, and chemicals for pool stores throughout New Jersey, Pennsylvania, Delaware and Maryland. 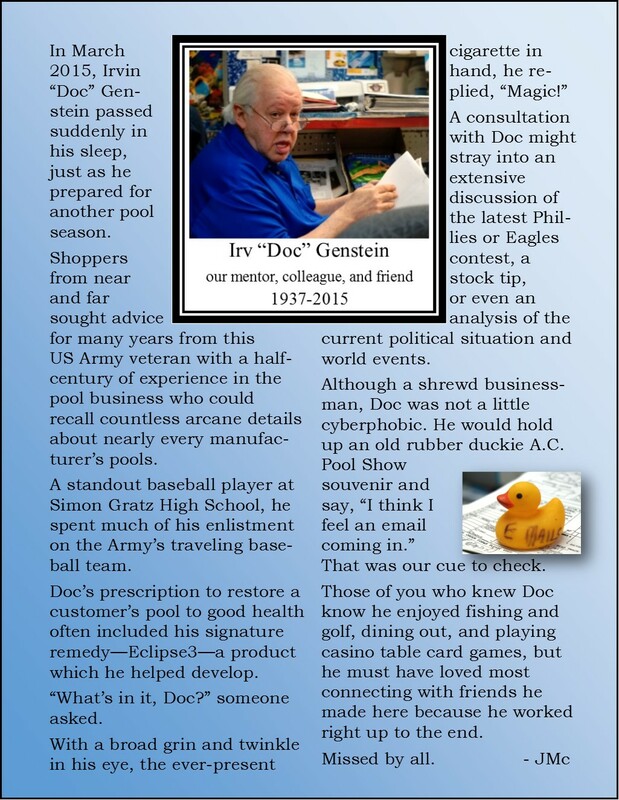 Sadly, Irv Genstein, or “Doc” as thousands of people knew him, passed away in March 2015. See our remembrance of him here. Now owned and operated by Doc’s former business partner, Jerry Senick, who also owns Better Pool Management in Philadelphia, PA, D&L continues to meet all of your pool and spa requirements. 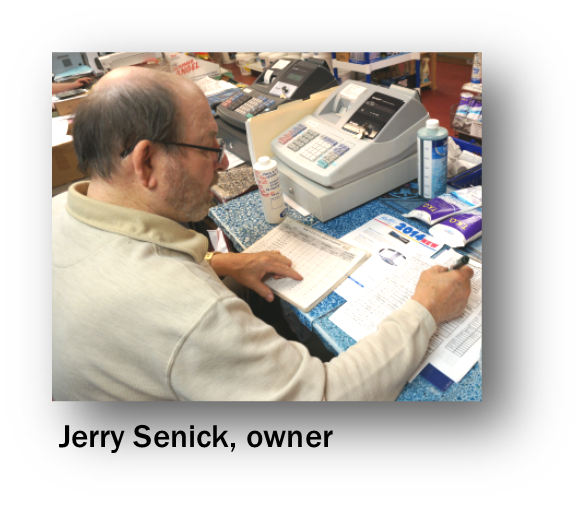 A retired school administrator with degrees in education and chemistry, Jerry Senick brings over thirty years experience in the pool business and a scientist’s analytical approach to solving your pool problems. You can still find at family-owned D&L Pools the same high level of products and dependable service you have come know and trust. 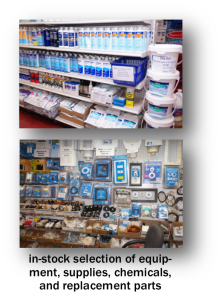 We have an amazing in-stock selection of equipment, supplies, chemicals, and replacement parts to meet all your pool and spa needs. 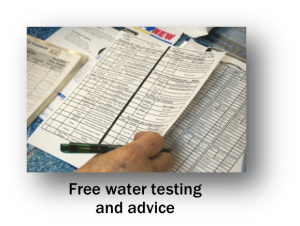 Our knowledgeable showroom staff is here to answer questions, troubleshoot problems and offer technical advice both before and after the sale!We offer free water testing with expert advice to keep your pool crystal clear with our premium quality chemicals, including our exclusive Eclipse 3 products. 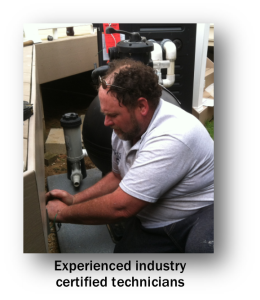 Our expert industry certified field technicians provide pool services from opening and closing pools, and making repairs, to providing a weekly valet maintenance program. We specialize in the sale and installation of above ground pools and offer a large selection of pool filters, pumps, and heaters to fit everyone’s pool needs. We are also a distributor and factory authorized repair center of Dolphin pool cleaners. Our in-house repair service also includes all makes and models of pool pumps, swimming pool filters and automatic pool cleaners. The staff at D&L Pools is looking forward to serving you. Store inventory includes: Automatic Chlorinators, Pool Covers, Pool Liners, Pool Cleaners and Vacuums, Filters, Filter Cartridges, Pumps, Pool Floats and Loungers, Pool Lights, Pool Heaters, Solar Covers, Pool Paint, Thermometers, Pool Toys, Inflatables, Games, Pool Ladders, Steps, and much more.